MAMMOTH HOT SPRINGS, WYO. — The map is back. The map in question is the large wooden one of the lower United States that hangs in the Map Room of the Mammoth Hot Springs Hotel in Yellowstone National Park. The map, all 17 feet, 10 inches by 10 feet four inches of it, was designed in the late 1930s—before Alaska and Hawaii became states—by architect Robert Reamer. Reamer designed or remodeled several Yellowstone structures, but he is perhaps best known for designing the awe-inspiring, log-constructed Old Faithful Inn. When park officials secured funding two years ago to renovate the hotel in which the map resides, they decided it would be a good time to send the map away—not only to get the Reamer map out of the way of construction dust and mayhem but for it to undergo its own cleanup and conservation. 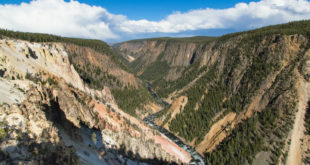 The Reamer map is made from 15 different types of wood and contains more than 2,500 pieces, Tobin Roop, National Park Service at Yellowstone branch chief of cultural resources, said last year. It comes apart into six separate 10-foot tall panels along the map’s lines of longitude, and was carefully taken down off last October, packed up and transported to the Western Archaeological and Conservation Center in Tucson, Arizona. It was returned in August in time for the hotel’s reopening. WACC houses the museum services for the National Park Service’s Intermountain Region, Dana Senge, a senior conservator who worked on the map, said recently. WACC staffers provide specialized museum services to park units that don’t have the expertise, space or time to do the work themselves, she explained. The map has had work done over the years. It was installed in 1937, she said, and was worked on in the 1960s and most recently in 1996-97. The shellac used is predicted to last 50 years, Senge said. Curators are careful to measure the pros and cons of each type of treatment, Senge said, and to keep careful notes for the next generation of conservators who may work on the piece in the future. Previous conservators had left detailed notes. The conservator team researched possible treatment for about a month, and started the actual work in December, finishing up in July. The team, which included Conservation Technicians Amy Molnar and Maria Lee in addition to Senge, put in a total of about 2,000 hours on the project. Two factors in the map’s environment have had some effect on it. Senge said the map once hung where steam pipes ran through the walls underneath it. And the room gets a lot of natural light from a wall of south-facing windows directly opposite the map. In 2010, working with concession company Xanterra Parks & Resorts, the windows were treated with a special UV-resistant film, Roop said. The film doesn’t darken the windows, but it blocks some of the UV light coming through the windows and hitting the map. Overall, the map is in pretty good shape. Working on a piece for so long, did the Reamer map reveal any secrets or give off a vibe?